Nickelodeon decks its programming this holiday season with a merry lineup of premieres and specials from the network’s hit live-action, animation and preschool series. Beginning Saturday, Nov. 28, the month-long celebration features holiday premieres of Game Shakers, Henry Danger, Make It Pop, Sanjay and Craig, Pig Goat Banana Cricket, Breadwinners, Blaze and the Monster Machines, Mutt & Stuff and Shimmer and Shine on Nickelodeon. On Saturday, Dec. 5, Nick stars gather for the biggest holiday party in a brand-new variety show, Nickelodeon Ho-Ho Holiday Special, premiering 8 p.m. (ET/PT) on Nickelodeon. The hour-long fest features the casts of The Thundermans, Bella and the Bulldogs, Henry Danger, 100 Things to do Before High School and Nicky, Ricky, Dicky and Dawn along with musical performances and comedy sketches. 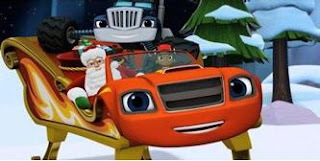 Nick Jr. also unwraps a week-long preschool celebration of jolly-themed premieres of Fresh Beat Band of Spies, Little Charmers, Peter Rabbit and Ben and Holly’s Little Kingdom, starting Thursday, Dec. 10. When Captain Man gets arrested for committing a petty crime, he is forced to spend Christmas in jail. Henry and Charlotte must try to help Captain Man have a good holiday. The Game Shakers visit Double G on the set of his live, self-indulgent “Double G’s Christmas Special.” During the opening number, his hair catches on fire and they must finish the show without him. After ruining Lundgren’s Huggle Day celebration, Sanjay and Craig set out to right their wrong with the help of movie hero Dolph Lundgren. With his help, Sanjay and Craig journey to find Huggle Bunny and discover the true meaning of Huggle Day. *The episode features Dolph Lundgren as himself. Pig searches the sewers for Filthy the Foot. Banana is forced to shop for Chalawunga gifts. Goat is determined to sing her song in the Chalawunga Parade and Cricket creates Mecha Foot for Pig. In a new spectacular hour-long variety special featuring musical numbers and comedy sketches, every Nickelodeon star under the sun shows up for the most amazing holiday party ever. However, it soon becomes clear that the whole evening is an evil trap devised by a mysterious stranger. The stars now have to struggle through various holiday-themed obstacles and challenges if they want to escape and find their way ho-ho-home. It is holiday season at MacKendrick Prep! When a blizzard traps everyone inside the school, Sun Hi, Jodi, and Corki learn the true meaning of the holidays. Meanwhile, the teens meet a mysterious new student. It’s Christmas Eve, and Blaze and AJ are helping Santa and his elves load his magic bag full of presents to deliver all over the world. Crusher tries to sneak into the bag, knocking it over and sending all the world’s presents flying away. Now it’s up to Blaze, AJ, and Crusher to rescue the presents and deliver them before Christmas morning. *The episode features Carl Reiner as a guest voice. It is Christmas at Mutt & Stuff and everything is decorated for a winter wonderland, but the forecast calls for sunny skies. With some Christmas magic and a visit from Phil the Snow Dog, the puppy Junior Shades gets to see real snow. It’s Christmas Eve and Leah forgot to mail Zac’s letter to Santa. 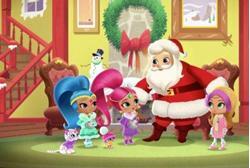 When she calls on Shimmer and Shine to help deliver the letter, they transport her to the North Pole where Leah can deliver it to Santa in person. After she accidentally wishes Santa to a tropical island, it’s up to Shimmer and Shine to deliver the presents and save Christmas genie-style. * The episode features Carl Reiner as Santa. SwaySway and Buhdeuce stay up all night waiting for Santa Crust to come while reading each other quazy holiday stories and singing Crustmas Carols. Thursday, Dec. 10 at 6 p.m.
“Snow”: It’s Christmas Eve, and the presents have just been delivered to Father Christmas at the North Pole. When Father Christmas rings up to say that there are toys missing, Ben, Holly, and their friends head off on a special trip to deliver the final box of toys. “The North Pole”: The Elf Plane is forced to land while en route to deliver the final box of presents. No one minds as it’s an opportunity for everyone to meet Father Christmas. Arctic Elves quickly wrap the toys before everyone sets off for home on Father Christmas' sleigh. Monday, Dec. 14 at 6 p.m. In a jolly holiday adventure, the Fresh Beat Band of Spies deck the halls of the North Pole in order to save Christmas from an overeager elf and his automated Santa. Tuesday, Dec. 15 at 6 p.m. When Hazel accidentally ruins Sparkle Night for all of Charmville, the Charmers hope that Santa Sparkle’s magic will set things right. They soon discover that the greatest magic of all is thinking of others before yourself. Wednesday, Dec. 16 at 6 p.m. It is Christmas Eve, and Father Christmas is making his deliveries to all the children of the world. Meanwhile, King Thistle is stuck in a cracker, Queen Thistle is stuck in a toy fairy castle, and the Wise Old Elf is stuck in a Christmas tree. Thursday, Dec. 17 at 6 p.m.
“The Christmas Star”: When Tommy Brock takes Cotton-tail's dolly, Peter soon discovers the only way to retrieve it is to give everyone in the woods what they want for Christmas. “Sleepy Hedgehog”: Peter volunteers to take Mrs. Tiggy-winkle home in time for her winter hibernation. Little does he know how much trouble a sleepy hedgehog can be. Starting Dec. 12 through Dec. 27, Nicktoons’ will also gift viewers with marathons from old favorites Catscratch, The Mighty B!, The X’s, El Tigre, Barnyard, Danny Phantom, Teenage Robot, Jimmy Neutron and Invader Zim.